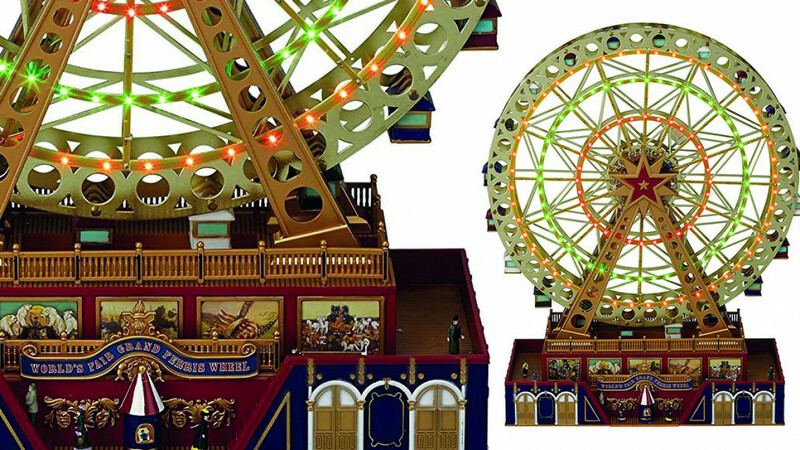 A magical World's Fair miniature Ferris wheel that plays 25 Christmas carols and 25 all year round classics. A wonderful, ornate decorative piece that you can display all year or just for the holidays. It is about 15 inches tall and all of the details have been carefully hand painted on. The built in tiny LED lights make this into a marvellous miniature light show that is sure to delight both young and old. The intricate metal framework is so detailed that it resembles a real Ferris wheel very closely. A great gift idea for anyone who loves carnivals or carnival collectables.